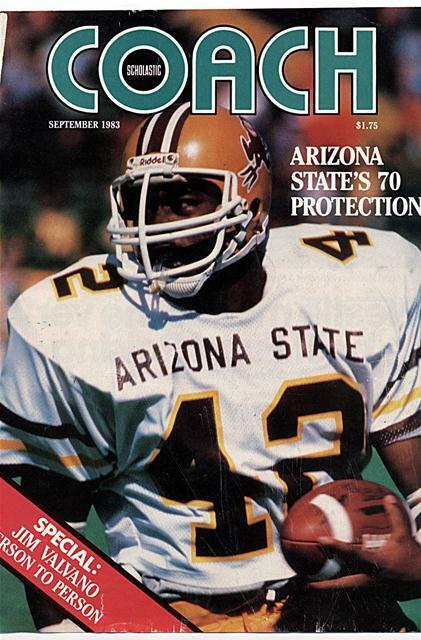 nology can be applied to the training of athletes. 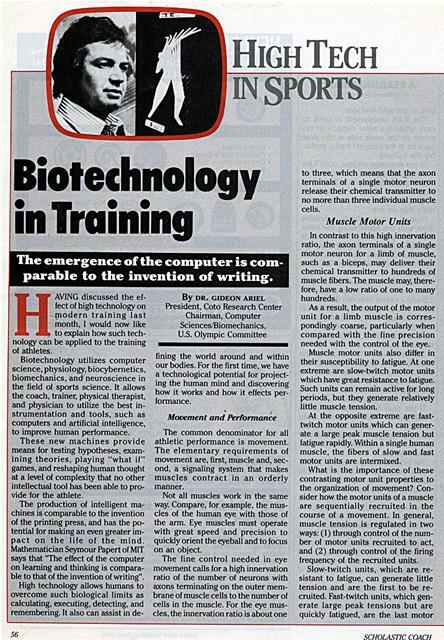 Biotechnology utilizes computer science, physiology, biocybernetics, biomechanics, and neuroscience in the field of sports science. It allows the coach, trainer, physical therapist, and physician to utilize the best instrumentation and tools, such as computers and artificial intelligence, to improve human performance. These new machines provide means for testing hypotheses, examining theories, playing "what if" games, and reshaping human thought at a level of complexity that no other intellectual tool has been able to provide for the athlete. The production of intelligent machines is comparable to the invention of the printing press, and has the potential for making an even greater impact on the life of the mind. Mathematician Seymour Papert of MIT says that "The effect of the computer on learning and thinking is comparable to that of the invention of writing". fining the world around and within our bodies. For the first time, we have a technological potential for projecting the human mind and discovering how it works and how it effects performance. The common denominator for all athletic performance is movement. The elementary requirements of movement are, first, muscle and, second, a signaling system that makes muscles contract in an orderly manner. Not all muscles work in the same way. Compare, for example, the muscles of the human eye with those of the arm. Eye muscles must operate with great speed and precision to quickly orient the eyeball and to focus on an object. to three, which means that the axon terminals of a single motor neuron release their chemical transmitter to no more than three individual muscle cells. In contrast to this high innervation ratio, the axon terminals of a single motor neuron for a limb of muscle, such as a biceps, may deliver their chemical transmitter to hundreds of muscle fibers. The muscle may, therefore, have a low ratio of one to many hundreds. As a result, the output of the motor unit for a limb muscle is correspondingly coarse, particularly when compared with the fine precision needed with the control of the eye. Muscle motor units also differ in their susceptibility to fatigue. At one extreme are slow-twitch motor units which have great resistance to fatigue. Such units can remain active for long periods, but they generate relatively little muscle tension. At the opposite extreme are fasttwitch motor units which can generate a large peak muscle tension but fatigue rapidly. Within a single human muscle, the fibers of slow and fast motor units are intermixed. What is the importance of these contrasting motor unit properties to the organization of movement? Consider how the motor units of a muscle are sequentially recruited in the course of a movement. In general, muscle tension is regulated in two ways: (1) through control of the number of motor units recruited to act, and (2) through control of the firing frequency of the recruited units. Athletic movement is a series of individual actions that begin with electrochemical processes infinitely swifter and more complicated than any known control system. For instance, a simple movement, such as crooking a finger or raising an eyebrow, involves a complex of neuromuscular happenings that cannot be duplicated by artificial means. The best man-made robot still moves in jerks and stops when compared to the subtle, fluid motions of a human. For us to train this complex system, it is necessary to rely on sophisticated training concepts and equipment. 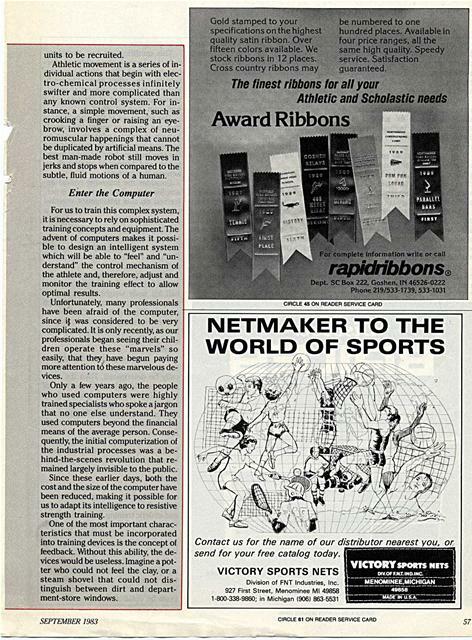 The advent of computers makes it possible to design an intelligent system which will be able to "feel" and "understand" the control mechanism of the athlete and, therefore, adjust and monitor the training effect to allow optimal results. Unfortunately, many professionals have been afraid of the computer, since it was considered to be very complicated. It is only recently, as our professionals began seeing their children operate these "marvels" so easily, that they, have begun paying more attention tO these marvelous devices. Only a few years ago, the people who used computers were highly trained specialists who spoke a jargon that no one else understand. They used computers beyond the financial means of the average person. Consequently, the initial computerization of the industrial processes was a behind-the-scenes revolution that remained largely invisible to the public. Since these earlier days, both the cost and the size of the computer have been reduced, making it possible for us to adapt its intelligence to resistive strength training. One of the most important characteristics that must be incorporated into training devices is the concept of feedback. Without this ability, the devices would be useless. Imagine a potter who could not feel the clay, or a steam shovel that could not distinguish between dirt and department-store windows. be numbered to one hundred places. Available in four price ranges, all the same high' quality. Speedy service. Satisfaction guaranteed. Contact us for the name of our distributor nearest you, send for your free catalog today. Division of FNT Industries, Inc. In other words, strength training devices are really effective only if they can recognize changes. And to recognize changes, the training device, because of its artificial intelligence, needs a computer. No other training modalities have had computers, and the athlete has had to determine the amount of resistance and the number of repetitions desired in order to increase the strength of the muscle. The neuromuscular requirements of the training session have also been ignored. The user has had to make the choices because the exercise modalities were inherently incapable of any intellectual participation. The advent of computers has made it possible to design exercise equipment with artificial intelligence, enabling the exercise modality to adjust to the training method selected by the individual user. tion of many unique features and mechanisms to the long-established fields of resistive exercise training, rehabilitation, and physical fitness. The underlying principle behind these innovations is that of a computer-controlled feedback or servomechanism which is able to maintain any desired pattern of force and motion throughout the range of each exercise, regardless of the magnitude or rate of force applied by the person exercising. This modification can, therefore, reflect changes in the pattern of exercise over time. The unique program selection can effect such changes in order to achieve a sequential or patterned progression of resistance for optimum training effect. The advantage of this capability is that the user can select the overall pattern of exercise while the machine assumes responsibility for choosing the precise force level, speed of movement, and temporal sequence to achieve that pattern. Consider the following typical examples of exercises which can be performed on this intelligence exercise machine. A user wishes to select a resistance (weight, in classical terms) starting at half his body weight, and to have that resistance increased by 10% in each successive repetition, until the user reaches a "sticking point" and cannot continue. With a classical weight machine, he would have to select weights equal to half his body weight and then stop between repetitions to change weights. The training effect of the exercise also would be considerably affected because, while he stopped to change weights, his muscles "recover". With the computerized machine, the person's weight would automatically be determined. 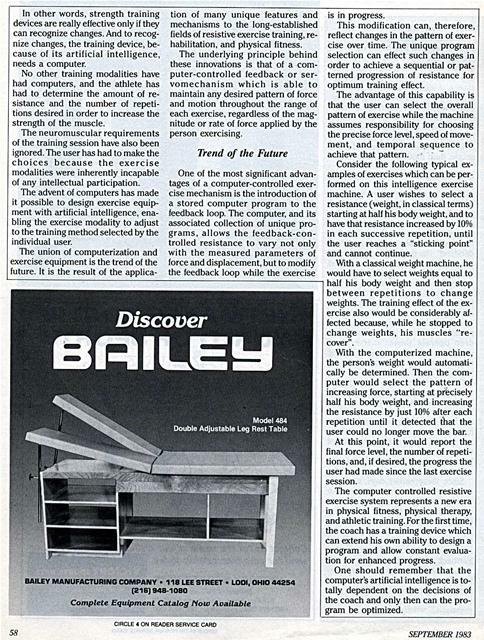 Then the computer would select the pattern of increasing force, starting at precisely half his body weight, and increasing the resistance by just 10% after each repetition until it detected that the user could no longer move the bar. At this point, it would report the final force level, the number of repetitions, and, if desired, the progress the user had made since the last exercise session. The computer controlled resistive exercise system represents a new era in physical fitness, physical therapy, and athletic training. For the first time, the coach has a training device which can extend his own ability to design a program and allow constant evaluation for enhanced progress. One should remember that the computer's artificial intelligence is totally dependent on the decisions of the coach and only then can the program be optimized. Generated on 4/20/2019 11:39:16 AM (PST) ADI/HQ/GBA/2019/ARIELCLOUD/v3.0.2018.0126.